I found this tip on the wonderful Hilary Rushford’s blog (remember, I am doing her Style Me September challenge this month!) It is the easiest way to make your closet seem new again. Tie a ribbon (or scarf) around the end of your closet rod and each day you get dressed pick an item from the front of the ribbon. After you wear an item place it behind the ribbon. Keep choosing clothing that is in front of the ribbon until there are none left. 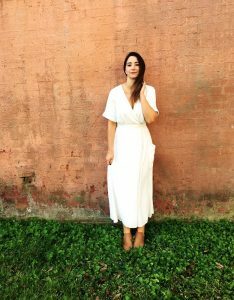 This helps you wear more from your closet that you don’t typically wear (did you know you wear 20% of your closet 80% of the time?) This simple tip will show what you are wearing and what you aren’t. You can find the lovely Hilary here and here on her blog!